I absolutely LOVE reading these submitted Material Obsession stories. I have to say, Renae + Brandi submitted theirs completely unbeknownst to each other and I think you will see the theme is clear: people just love their materials almost as much as they love living breathing people :) and it’s a beautiful thing. If you would like to submit a Material Obsession story, please do! Details here. This woman loves felt so much, she’s made it her mission to supply it to you in various forms. Renae wants you to get to know this beautiful material that can add some color and fun to your life – specifically through her beautiful designs of course. 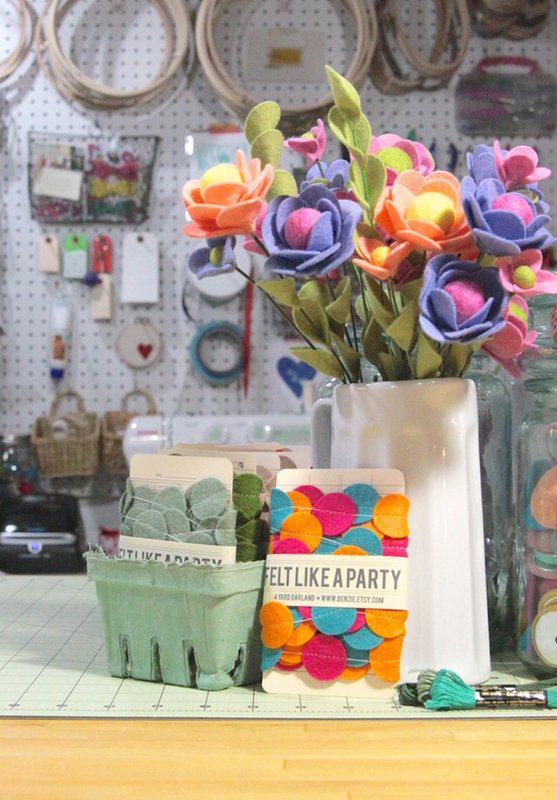 If you like parties + crafts, this is a cup of tea for you. While I am here, I also wanted to bring you attention to this page with important info.. If anyone has a “material obsession” it’s me! 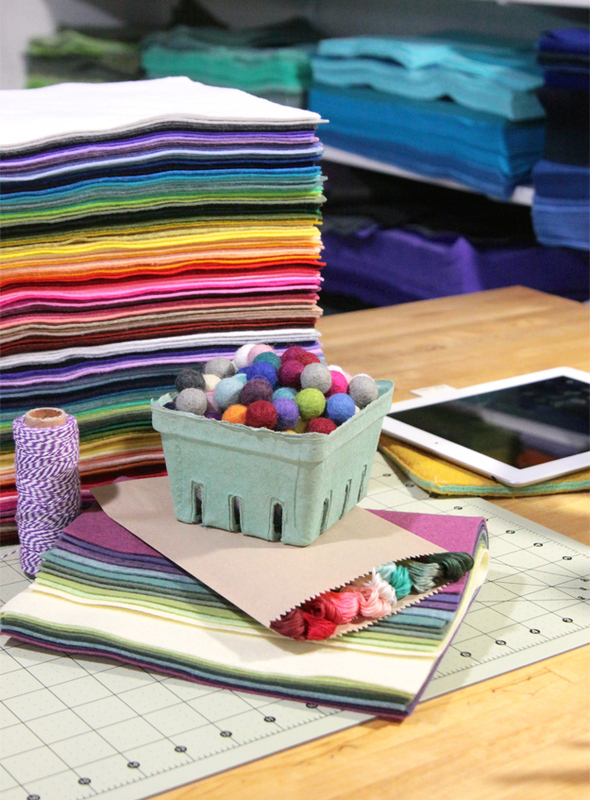 Felt is the most versatile fabric available to crafters. It can be cut, sewn, glued, felted, stitched and embroidered. 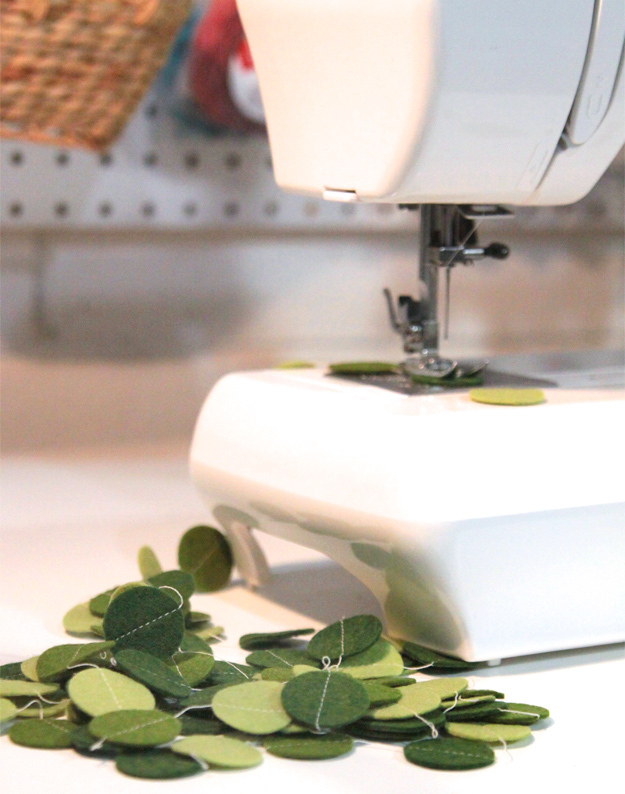 It works well for novice and expert crafters alike. It engenders wide appeal for all age groups and demographics. Finally, it adds class, color and touchability to any craft project. 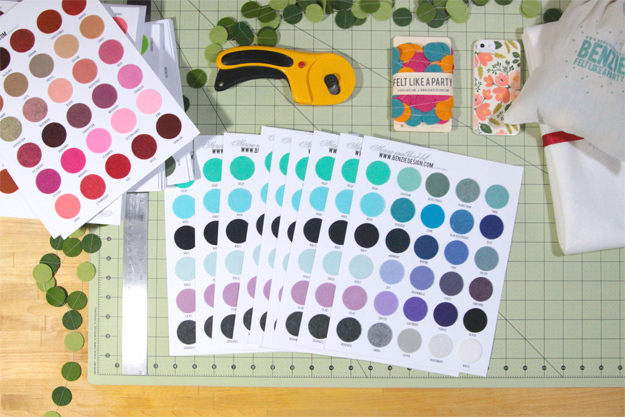 So, as an avid creator and craft designer, felt had become my new best friend. But my friendship with big-box felt was disintegrating as quickly as my projects made with this inferior material. I was on the market for a new felt friend. I was looking for something better, something more reliable and sturdy and at an affordable price. But most of all, it had to be beautiful! Sweep me off my feet, take my breath away, weak in the knees beautiful! We met, we fell in love. Felt had become my new best friend. And I opened Benzie Design, a wool-blend felt shop. Our felt is a non-woven blend of wool and rayon fibers – a combination that creates a soft and pliable material without sacrificing strength or affordability. 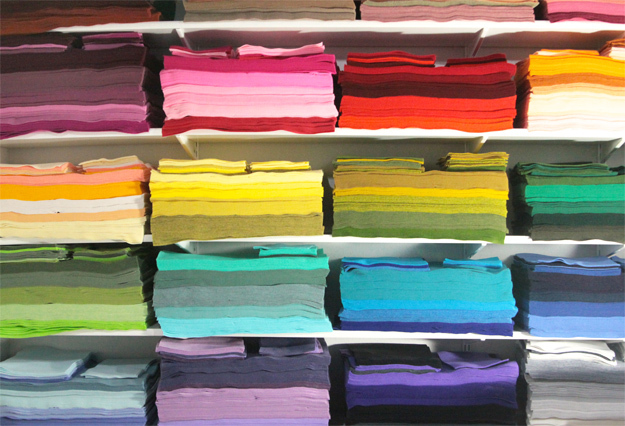 And if you thought a rainbow was colorful, Benzie’s felt has over 90 brilliant hues! Benzie’s felt is naturally gorgeous, but it never hurts to accessorize! DMC floss and Benzie’s Felt go together like Wet & Wild nail polish and teenage girl slumber parties. There is a corresponding DMC floss for each felt color at Benzie’s. In our “Felt-Like-a-Party” Garland line, garlands are fully customizable, by size and color, and will add that special “something” to any party or celebration. And what is a party without confetti? (“nothing” – danielle) Benzie also carries a full line of “Felt-Fetti.” Shhh. Don’t tell the garlands or the Felt-Fetti, but felt poms are where the real party’s at! Benzie has recently added a vast collection of felt poms. These felt poms are like gold! No, even better. They are like craft candy. Delicious! Now that you are properly felt-ified, go visit Renae’s supply shop and design shop on Etsy + follow her on Facebook and Instagram. If you need more felty stories, read her blog. I’m feeling so felty right now. Need to go make something.